英文摘要：Camouflage is an important strategy to deter predators, it may work to reduce predator detection and recognition risk. This review outlines different types of camouflage, such as crypsis, masquerade, motion dazzle and motion camouflage. Moreover, current issues in research are pointed out and some suggestions are made for future work. Akkaynak D, Allen JJ, Mäthger LM, et al. 2013. Quantification of cuttlefish (Sepia officinalis) camouflage: a study of color and luminance using in situ spectrometry[J]. Journal of Comparative Physiology A, 199(3): 211-225. Allen JJ, Mäthger LM, Barbosa A, et al. 2009. Cuttlefish use visual cues to control three-dimensional skin papillae for camouflage[J]. Journal of Comparative Physiology A, 195: 547-555. Ammermüller J, Itzhaki A, Weiler R, et al. 1998. UV-sensitive input to horizontal cells in the turtle retina[J]. European Journal of Neuroscience, 10(5): 1544-1552. Anderson AJ, McOwan PW. 2003. Humans deceived by predatory stealth strategy camouflaging motion[J]. Proceedings of the Royal Society, Series B, 270: S18-S20. Barbosa A, Litman L, Hanlon RT. 2008. Changeable cuttlefish camouflage is influenced by horizontal and vertical aspects of the visual background[J]. Journal of Comparative Physiology A, 194: 405-413. Beddard FE. 1895. Animal colouration: an account of the principal facts and theories relating to the colours and markings of animals[M]. London: Swan Sonnenschein. Behrens RR. 1999. The role of artists in ship camouflage during world war Ⅰ[J]. Leonardo, 32(1): 53-59. Chiao CC, Wickiser JK, Allen JJ, et al. 2011. Hyperspectral imaging of cuttlefish camouflage indicates good color match in the eyes of fish predators[J]. Proceedings of the National Academy of Sciences of USA, 108(22): 9148-9153. Cott HB. 1940. Adaptive coloration in animals[M]. London, UK: Methuen. Craik KJ. 1944. White plumage of seabirds[J]. Nature, 153: 228. Cuthill IC, Stevens M, Sheppard J, et al. 2005. Disruptive coloration and background pattern matching[J]. Nature, 434(7029): 72-74. Denton EJ, Nicol JA. 1966. A survey of reflectivity in silvery teleosts[J]. Journal of the Marine Biological Association of the UK, 46: 685-722. Dimitrova M, Stobbe N, Schaefer HM, et al. 2009. Concealed by conspicuousness: distractive prey markings and backgrounds[J]. Proceedings of the Royal Society, Series B, 276: 1905-1910. Edmunds M. 1974. Defence in animals: a survey of anti-predator defences[M]. Harlow, UK: Longman. Eltringham SK. 1979. The ecology and conservation of large African mammals[M]. London: Macmillan. Endler JA. 1978. A predator's view of animal color patterns[J]. Evolutionary Biology, 11: 319-364. Endler JA. 1981. An overview of the relationships between mimicry and crypsis[J]. Biological Journal of the Linnean Society, 16: 25-31. Endler JA. 1984. Progressive background matching in moths and a quantitative measure of crypsis[J]. Biological Journal of the Linnean Society, 22: 187-231. Endler JA. 2006. Disruptive and cryptic coloration[J]. Proceedings of the Royal Society B, 273: 2425-2426. Eterovick PC, Oliveira FFR, Tattersall GJ. 2010. Threatened tadpoles of Bokermannohyla alvarengai (Anura: Hylidae) choose backgrounds that enhance crypsis potential[J]. Biological Journal of the Linnean Society, 101(2): 437-446. Fraser S, Callahan A, Klassen D, et al. 2007. Empirical tests of the role of disruptive coloration in reducing detectability[J]. Proceedings of the Royal Society B, 274: 1325-1331. Hanlon RT, Chiao CC, Mäthger LM, et al. 2011. Chapter 9: Rapid adaptive camouflage in cephalopods[M]// Stevens M, Merilaita S. Animal camouflage: mechanisms and function. Cambridge, UK: Cambridge University Press: 145-163. Hanlon RT, Forsythe JW, Joneschild DE. 1999. Crypsis, conspicuousness, mimicry and polyphenism as antipredator defences of foraging octopuses on Indo-Pacific coral reefs, with a method of quantifying crypsis from video tapes[J]. Biological Journal of the Linnean Society, 66: 1-22. Hanlon RT, Messenger JB. 1996. Cephalopod behaviour[M]. Cambridge, UK: Cambridge University Press. Honkavaara J, Koivula M, Korpimäki E, et al. 2002. Ultraviolet vision and foraging in terrestrial vertebrates[J]. Oikos, 98(3): 505-511. Huffard CL, Boneka F, Full RJ. 2005. Underwater bipedal locomotion by octopuses in disguise[J]. Science, 307: 1927. Huffard CL. 2006. Locomotion by Abdopus aculeatus (Cephalopoda: Octopodidae): walking the line between primary and secondary defences[J]. Journal of Experimental Biology, 209: 3697-3707. Jackson JF, Ingram W, Campbell HW. 1976. The dorsal pigmentation pattern of snakes as an antipredator strategy: a multivariate approach[J]. American Naturalist, 110: 1029-1053. Johnsen S, Sosik HM. 2003. Cryptic colouration and mirrored sides as camouflage strategies in near surface pelagic habitats: implications for foraging and predator avoidance[J]. Limnology and Oceanography, 48: 1277-1288. Johnsen S. 2001. Hidden in plain sight: the ecology and physiology of organismal transparency[J]. Biological Bulletin, 201: 301-318. Kiltie RA. 1988. Countershading: universally deceptive or deceptively universal[J]. Trends in Ecology and Evolution, 3: 21-23. Kingdon J. 1979. East African mammals: part IIIb large mammals[M]. London: Academic Press. Kingdon J. 1984. The zebra's stripes: an aid to group cohesion[J]. The Encyclopedia of Mammals: 486-487. Krupa JJ, Gelusa KN. 2000. Matching the color of excavated soil: cryptic coloration in the plains pocket gopher (Geomys bursarius)[J]. Journal of Mammology, 81: 86-96. Lee WS, Kwon YS, Yoo JC. 2010. Egg survival is related to the colour matching of eggs to nest background in black-tailed gulls[J]. Journal of Ornithology, 151(4): 765-770. Lindell LE, Forsman A. 1996. Sexual dichromatism in snakes: support for the flicker-fusion hypothesis[J]. Behavioral Ecology, 74: 2254-2256. Lovell PG, Ruxton GD, Langridge KV, et al. 2013. Egg-laying substrate selection for optimal camouflage by quail[J]. Current Biology, 23(3): 260-264. Mäthger LM, Chiao CC, Barbosa A, et al. 2008. Color matching on natural substrates in cuttlefish, Sepia officinalis[J]. Journal of Comparative Physiology A, 194(6): 577-585. Merilaita S, Linda J. 2005. Background-matching and disruptive coloration, and the evolution of cryptic coloration[J]. Proceedings of the Royal Society B: Biological Sciences, 272(1563): 665-670. Merilaita S. 1998. Crypsis through disruptive coloration in an isopod[J]. Proc R Soc B, 265: 1059-1064. Mizutani A, Chahl JS, Srinivasan MV. 2003. Insect behaviour: motion camouflage in dragonflies[J]. Nature, 423: 604. Norris KS, Lowe CH. 1964. 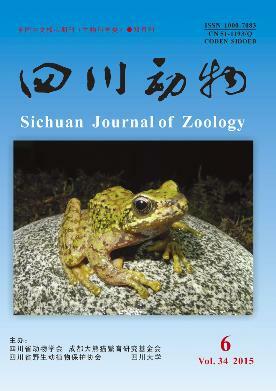 An analysis of background color-matching in amphibians and reptiles[J]. Ecology, 45: 565-580. Osorio D, Srinivasan MV. 1991. Camouflage by edge enhancement in animal coloration patterns and its implications for visual mechanisms[J]. Proceedings of the Royal Society B, 244(1310): 81-85. Polat U, Sagi D. 1993. Lateral interactions between spatial channels: suppression and facilitation of revealed by lateral masking experiments[J]. Vision Research, 33: 993-999. Pough FH. 1976. Multiple cryptic effects of crossbanded and ringed patterns of snakes[J]. Copeia: 834-836. Poulton EB. 1888. Notes in 1887 upon lepidopterous larvae, etc., including a complete account of the life-history of the larvae of Sphinx convolvuli and Aglia tau[J]. Transactions of the Entomological Society of London: 515-606. Poulton EB. 1890. The Colours of Animals: Their meaning and use, especially considered in the case of insects[M]. London: Kegan Paul, Trench Trubner & Co.
Rowland HM, Speed MP, Ruxton GD, et al. 2007. Countershading enhances cryptic protection: an experiment with wild birds and artificial prey[J]. Animal Behaviour, 74(5): 1249-1258. Rowland HM. 2009. From Abbot Thayer to the present day: what have we learned about the function of countershading? [J]. Philosophical Transactions of the Royal Society, Series B, 364: 519-527. Ruxton GD, Sherratt TN, Speed MP. 2004b. Avoiding attack: the evolutionary ecology of crypsis, warning signals, and mimicry[M]. Oxford, UK: Oxford University Press. Ruxton GD, Speed MP, Kelly DJ. 2004a. What, if anything, is the adaptive function of countershading?[J]. Animal Behaviour, 68(3): 445-451. Ruxton GD. 2002. The possible fitness benefits of striped coat coloration for zebra[J]. Mammal Review, 32(4): 237-244. Schaefer HM, Stobbe N. 2006. Disruptive coloration provides camouflage independent of background matching[J]. Proceedings of the Royal Society B, 273(1600): 2427-2432. Shine R, Madsen T. 1994. Sexual dichromatism in snakes of the genus Viperia: a review and a new evolutionary hypothesis[J]. Journal of Herpetology, 28: 114-117. Shohet AJ, Baddeley RJ, Anderson JC, et al. 2006. Cuttlefish responses to visual orientation of substrates, water flow and a model of motion camouflage[J]. Journal of Experimental Biology, 209: 4717-4723. Skelhorn J, Rowland HM, Delf J, et al. 2011. Density-dependent predation influences the evolution and behavior of masquerading prey[J]. Proceedings of the National Academy of Sciences, 108(16): 6532-6536. Skelhorn J, Rowland HM, Ruxton GD. 2010a. The evolution and ecology of masquerade[J]. Biological Journal of the Linnean Society, 99(1): 1-8. Skelhorn J, Rowland HM, Speed MP, et al. 2010b. Masquerade: camouflage without crypsis[J]. Science, 327: 51. Skelhorn J, Rowland HM, Speed MP, et al. 2010c. Size-dependent misclassification of masquerading prey[J]. Behavioral Ecology, 21(6): 1344-1348. Skelhorn J, Ruxton GD. 2011. Context-dependent misclassification of masquerading prey[J]. Evolutionary Ecology, 25(4): 751-761. Srinivasan MV, Davey M. 1995. Strategies for active camouflage of motion[J]. Proceedings of the Royal Society of London B: Biological Sciences, 259: 19-25. Stevens M, Cuthill IC, Windsor AMM, et al. 2006. Disruptive contrast in animal camouflage[J]. Proceedings of the Royal Society B, 273: 2433-2438. Stevens M, Graham J, Winney IS, et al. 2008a. Testing Thayer's hypothesis: can camouflage work by distraction?[J]. Biology Letters, 4: 648-650. Stevens M, Merilaita S. 2011. Chapter 1: animal camouflage: mechanisms and function[M]// Stevens M, Merilaita S. Animal camouflage: mechanisms and function. Cambridge, UK: Cambridge University Press: 1-16. Stevens M, Merilaita S. 2009. Animal camouflage: current issues and new perspectives[J]. Philosophical Transactions of the Royal Society B, 364: 423-427. Stevens M, Yule DH, Ruxton GD. 2008b. Dazzle coloration and prey movement[J]. Proceedings of the Royal Society, Series B, 275: 2639-2643. Stevens M. 2007. Predator perception and the interrelation between different forms of protective coloration[J]. Proceedings of the Royal Society of London: Biological Sciences, 274: 1457-1464. Thayer AH. 1896. The law which underlies protective coloration[J]. The Auk, 13: 477-482. Thayer GH. 1909. Concealing-colouration in the animal kingdom: an exposition of the laws of disguise through colour and pattern, being a summary of Abbot H Thayer's discoveries[M]. New York: Macmillan. Théry M, Casas J. 2002. Visual systems: predator and prey views of spider camouflage[J]. Nature, 415(6868): 133-133. Ventura DF, Souza De JM, Devoe RD, et al. 1999. UV responses in the retina of the turtle[J]. Visual Neuroscience, 16(2): 191-204. Waage JK. 1981. How the zebra got its stripes: biting flies as selective agents in the evolution of zebra colouration[J]. Journal of the Entomological Society of South Africa, 44: 351-358. Wallace AR. 1889. Darwinism: an exposition of the theory of natural selection with some of its applications[M]. London: Macmillan. Wertheim AH, Hooge ITC, Krikke K, et al. 2006. How important is lateral masking in visual search?[J]. Experimental Brain Research, 170: 387-402. Wickler W. 1968. Mimicry[M]. London: Weidenfeld & Nicolson. Wuerger S, Shapley R, Rubin N. 1996. "On the visually perceived direction of motion" by Hans Wallach: 60 years later[J]. Perception, 25: 1317-1367. Zylinski S, Osorio D, Shohet AJ. 2009. Cuttlefish camoufiage: context-dependent body pattern use during motion[J]. Proceedings of the Royal Society, Series B, 276: 3963-3969.